For the greatest blogging challenge in history? Because, time is drawing near. I know that I have not been around much. I want to thank all of you who responded to my facebook prayer request. I am so appreciative of all the kind words and prayers for my dad. He is doing better & is off of the ventilator, but he is in his mid 80's so we have to prepare ourselves. No matter how old a family member is, losing your dad or anyone is devastating. He is still with us and I ask for your continued prayers. Let me tell you something else that I uber grateful for right now. 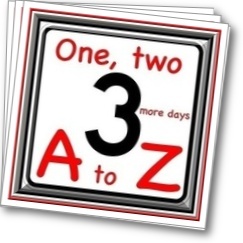 As an A to Z challenge newbie, I am filled with the same anxious feeling some of you may also be experiencing. In late February, I took the advise of Captain Ninja, Alex J. Cavanaugh and D.L. Hammonds over at Cruising Altitude (both are co-host) & several other bloggers who suggested we try to write at least some of our daily A to Z post in advance. With everything going on in my personal life this past month, I would be a basket case if I had not already written most of my post. Don, posted an excellent article back in February, that helped me get prepared. He used to be involved in planning & scheduling and he wrote instructional manuals and trained new employees so he is someone I count on as a my go to guru for events like the A to Z blogging challenge. Read his post, which includes his A to Z Survival Kit for the month of April. I am sure most of you have some idea of what to write about by now. I like the idea of using a theme. I won't tell you what mine is, but I have a couple of ideas for those of you still contemplating what you will write. What about an A to Z theme of your own personal Bucket List. Obviously, the letter "B" would stand for the " Best Seller List" that your next novel will climb to the top of. How about an A to Z theme of all the places you want to visit, from Aruba to Zetland. How about the title of your next 26 novels beginning with A and the last one with Z. Since I write mystery/suspense/legal thrillers, mine would be something like APPEAL OF INNOCENCE & ZERO DEFENSE. 2. Visit as many other bloggers in the challenge as you can. My goal is to visit the 20 blogs below my name & hopefully the 20 below that and the 20 above my name. 3. 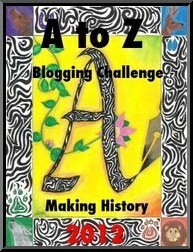 Make sure your A to Z badge is placed high up on your blog where it is visible to every person who clicks on your blog. 4. and for the sake of the insanity of everyone participating, please make it easy for readers to comment on your blog. Turn off the word verification, make sure your comment area is easy to find. 5. Make sure your "follow me" section is prominently displayed at the TOP of your blog so new readers can easily find it and become your newest blog followers. Most importantly, have fun, relax & make new friends. I am also an A to Z newbie. I look forward to reading your posts! Melissa, I am so sorry to hear about your dad. I haven't been around much these past couple of months either, due to illness. My thoughts are with you. You'll be fine! And you will make so many new friends. My third year doing the Challenge and it's only getting better. ...And I also hope your father is okay. I meant to write that in my last comment too. I know that I will be busy as a (fill in the blank). Nevertheless, I have not written a single blog in advance, preferring instead to rush headlong into the fray. Melissa, I'm not on FB so I didn't know about your Dad. Please know I'm thinking of you and your family. Hope your husband is doing okay now.